On Sunday afternoon we loaded up a couple of cars and took our production staff out to visit Newspring Church in Anderson, South Carolina. I’ve been meaning to get out to visit for sometime because I’ve known their sound guru Joel for a bit now, and they’re only a couple hours away from us. After some poor Google Maps directions were rectified by a couple of friendly Newspring staffers over the phone, we found ourselves pulling in to an incredibly warm reception. The staff was super friendly as they led us inside and gave us a tour of their room. I spent most of my time hanging out with Joel admiring the system he’s put together. 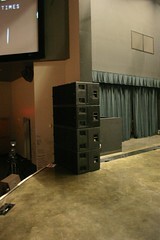 His main PA is made up of dV-DOSC line arrays with dV-SUBS hanging next to them for low-mids. System processing was XTA. 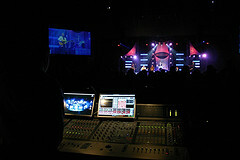 FOH and MON consoles are Digidesign Venues. It sounded good. I enjoyed it. But the thing that I thought was really cool was how Joel set up the system infrastructure. I did a pretty big system upgrade at my last church, and now I’m getting ready to do two more at North Point so infrastructure is an infatuation of mine. 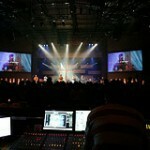 After visiting Newspring if I was doing a new building I would totally steal what he’s done here. Basically the room is setup as if it needs to handle a tour bringing in a system. There is basically a cable trough that wraps around the entire stage with metal covers on the sides of the stage so you can drive a lift over them. It looks very clean to the point that you probably wouldn’t even notice it if you weren’t looking for it. 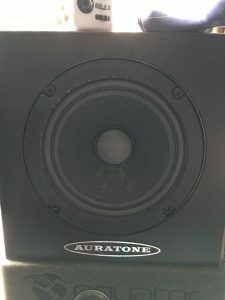 In the photo of their subs you can see one of the metal covers visible behind the subs. I wish I had taken more photos, but the simplicity of the setup doesn’t give you much to look at. They use a collection of drop snakes and boxes on the stage to plug in their instruments wherever they need them. Floor pockets in the front give access to multipin disconnects to connect more drop boxes as needed for frontline players. On top of that, most of their gear is road-ready. 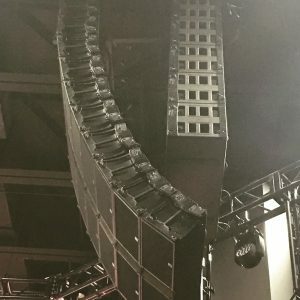 If you took a tour of their amp rooms you wouldn’t really think much of it, but the beauty is if they need to do a big event offsite, they can fairly easily pull their rig out. Joel mentioned they do a conference in Florida every year and he takes a lot of his gear because it’s cheaper to transport what he owns than rent for a week. Maybe some of you are wondering why this is so cool in a permanent install. For my money, it’s all about the future. 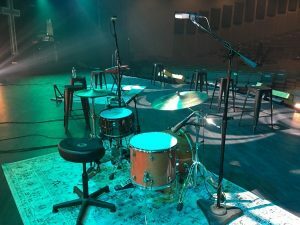 When Newspring outgrows or outlives their existing setup–and one or the other is pretty much inevitable for any facility–it will be incredibly easy to upgrade. The old stuff easily comes out, and the new stuff goes in. 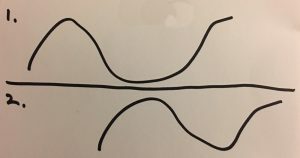 I have a meeting this week to discuss how we are going to handle the install process when it comes time to upgrade our cables harness, and it isn’t going to be easy; it could seriously take a couple weeks to pull out the old and install the new. I bet Joel could do it in a day if he needed to. Upgrading exisiting facilities can be a nightmare to do depending on how the building was built, but Newspring is so far ahead of the curve on this. I am quite jealous. Maintenance should also be pretty easy with this setup. If something goes bad and is unserviceable on stage, just pull it out and fix it or replace it. I really enjoyed my visit. The folks at Newspring are incredibly gracious and welcoming, and their service rocked; as my buddy Dewey would say, it was a good loud. It was awesome to see what they’re doing, and how God is using them in their community. Life change is definitely happening there. Just within the one service I literally was able to watch it taking place. I don’t know about you, but that’s why I make noise every Sunday instead of somewhere else. I look forward to many future visits, and if you’re ever passing through on a Sunday you should drop in and visit them.